With over a century of wheelin’ and dealin’ to back it up, Gwangjang Market in Seoul breathes rarified air. In fact, Gwangjang tops in as the oldest remaining traditional market in Korea. From shoes to fashion accessories and modern clothing to hanbok (traditional Korean formal wear), Gwangjang Market’s got just about everything under the sun. And lest we forget the food. Besides being famous for its textiles and hanbok, Gwangjang Market is at its heart a foodie paradise. All of the best Korean food pops up in the stalls here. 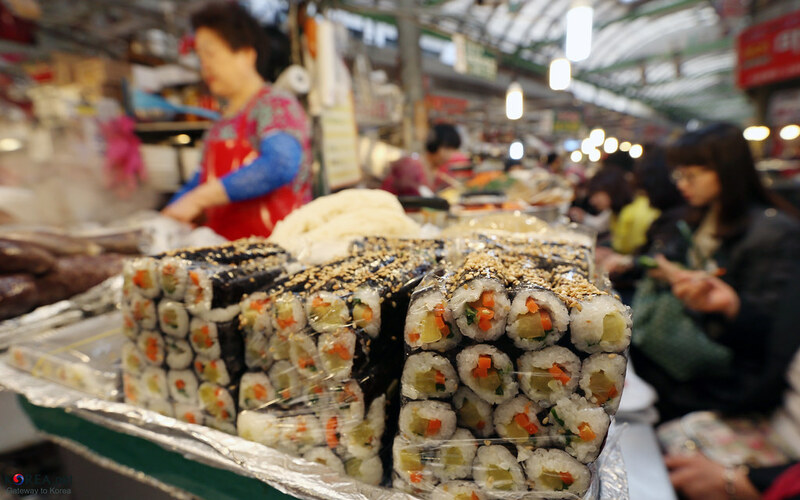 Whether you’re in the mood for kalguksu (hand-cut wheat noodles) or gimbap (seaweed rice rolls), your tastebuds will find it at Gwangjang Market. Since I’m fairly positive that you aren’t here to research where to find a silk scarf, let’s just cut straight to the heart of the matter: street food. As one of the best places to eat in Seoul and one of Seoul’s top food markets, you’re absolutely spoiled for choice at Gwangjang Market. Plying through stall after stall can be overwhelming. To ease your mind I’d stick with the same advice I’d give for any of the best night markets in Seoul (or street food markets in general). Walk through once to get a feel for what you’d like to try, and stop for the snack you’re most drawn to. A good rule of thumb at Gwangjang Market, like anywhere else, is to follow your nose and the line-ups. 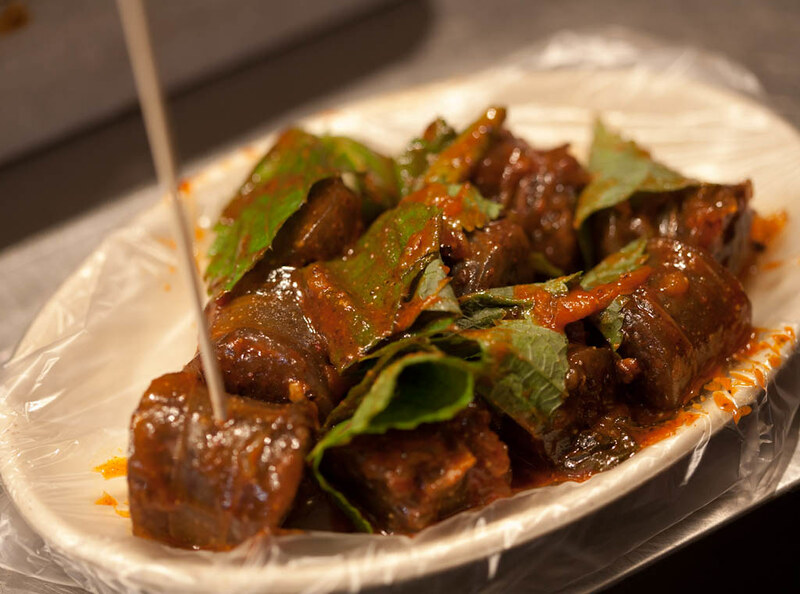 Locals generally know their stuff, and although their tastes might not be 100% attuned to yours, you usually won’t go wrong with testing out a local favourite that could become a favourite of your own. Any market worth its salt’s going to deal in a healthy supply of gimbap. One of the most popular snacks in Korea, gimbap resembles a Korean version of Japanese maki rolls with ingredients like cucumbers, eggs, and carrots rolled up into seaweed-wrapped rice rolls. I have to admit that I wasn’t an instant fan of gimbap. It might take more than a few tries to get used to the dry scrunchy texture of the seaweed wrap along with its light seafood-like taste. In the end, you might, like me, grow to appreciate this healthy and filling snack. Just remember that the rice makes it quite a dense snack. Don’t eat too many otherwise you’ll limit your ability to try all the other goodies at Gwangjang Market! 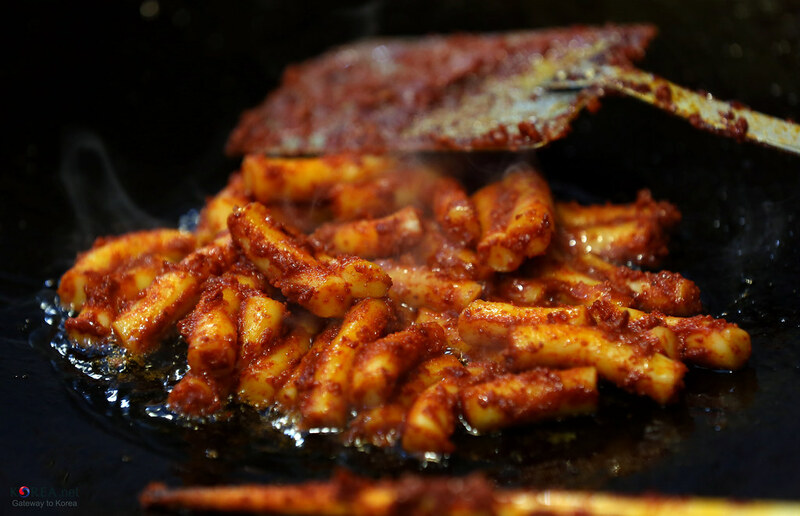 If you’re inexperienced in Korean street food, tteokbokki will deliver a solid introduction. Bathed in a hot pepper sauce (gochujang), these mildly spicy stir-fried rice cakes aren’t quite what you’d expect from the description. The texture isn’t hard like the rice cakes you’d eat as a movie snack, but similar to gnocchi in its silky chewiness. Like other rice-based dishes, tteokbokki can feel heavy and filling. Grab a small helping as a starter so that you’ll have room to explore other delicious treats at Gwangjang Market! 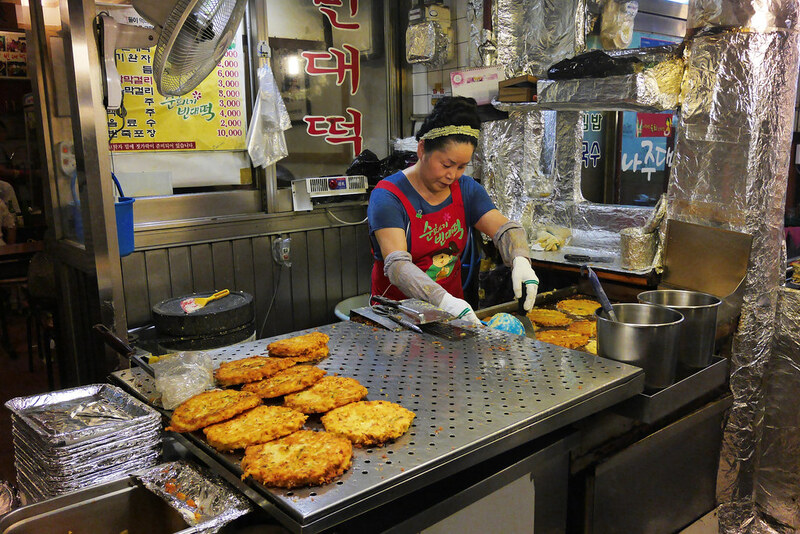 Another top Seoul street food, bindaetteok is a pan-fried savoury Korean pancake made from ground mung beans and seasoned with meat, eggs and vegetables like kimchi and green onions. When fried in a pan at high heat, bindaetteok come out crispy and packed with flavour. Unlike our usual idea of pancakes, bindaetteok isn’t just a breakfast staple. You can enjoy these tasty snacks any time of day—or even as a meal on its own in a pinch! If savoury pancakes aren’t your thing, the more familiar sweet flavours of hotteok might be more to your liking. 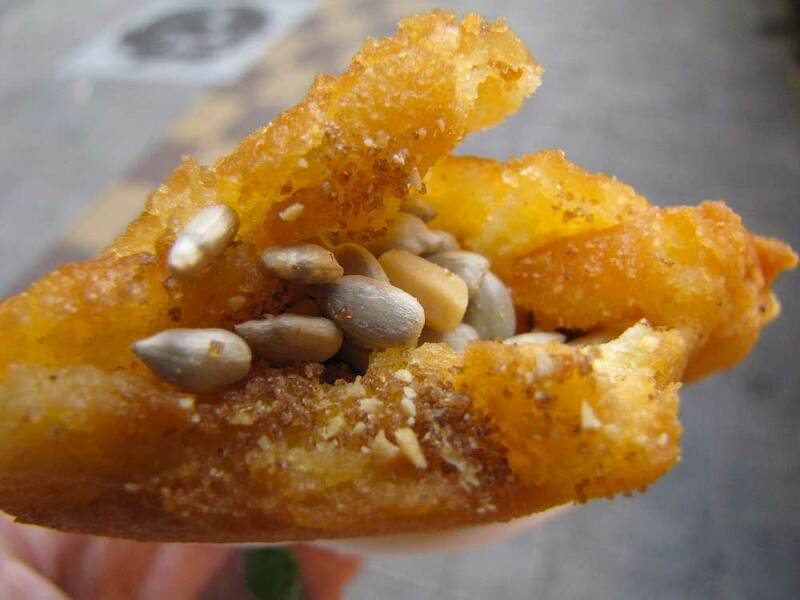 One of the other quintessential street foods of Gwangjang Market, hotteok are more in line with the western idea of sweet pancakes, crafted from a wheat flour dough and filled with ingredients like brown sugar, cinnamon, honey, and nuts. As you’d imagine, hotteok are perfect to imbibe as a dessert to close out your Gwangjang Market food fiesta! No, we’re not talking about a delicious serving of soft serve ice-cream topped with caramel. In fact, when I tell you what exactly you’re getting into with sundae, you might not be so pumped about it. Sundae (pronounced soon-day) is a type of Korean blood sausage that, unlike its British counterpart, is surprisingly juicy and flavourful. Many of the varieties of sundae found throughout Gwangjang Market throw in dangmyeon (glass mung bean noodles) and sticky rice instead of meat. There’s no shame in passing up one of Gwangjang Market’s most gut-heaving street foods, sannakji. You’d truly have to have a stomach of steel (I know I don’t!) to tackle this Korea “delicacy” of live baby octopus tentacles. It might come as a surprise that Koreans take their drinking quite seriously. You’ve probably heard of soju, Korea’s answer to sake, but in traditional Gwangjang Market the country’s original national alcoholic beverage, makgeolli, reigns supreme. Like soju, makgeolli is a traditional liquor made from rice, but unfiltered, giving it a cloudy milky appearance. It’s similar to light vodka in its flavour but with a slightly sweeter taste. Wash down your Gwangjang Market street snacks with a little makgeolli and you’ll even get to enjoy its built-in probiotics to help you digest! Using Seoul’s public transportation system, hop on metro Line 1 to Jongno 5-ga Station. Come out to street-level through Exit 7 or 8. Walk south along Dongho-ro and take the first right. The entrance to the market will be straight ahead. Gwangjang Market is situated in the southern fringes of Jongno-gu, one of the best neighbourhoods to stay in Seoul. If you decide to stay around here, you’ll be within walking distance of many of Seoul’s best attractions including Dongdaemun Market and Jongmyo Shrine. Ibis Ambassador Seoul Dongdaemun: A no-frills 3-star hotel offering good value, if a little cozy, rooms in a central location. Gwangjang Market is just a 6-minute walk from the property. Best Western Premier Hotel Kukdo: A 4-star hotels featuring spacious rooms with large picture windows to brighten up the atmosphere. 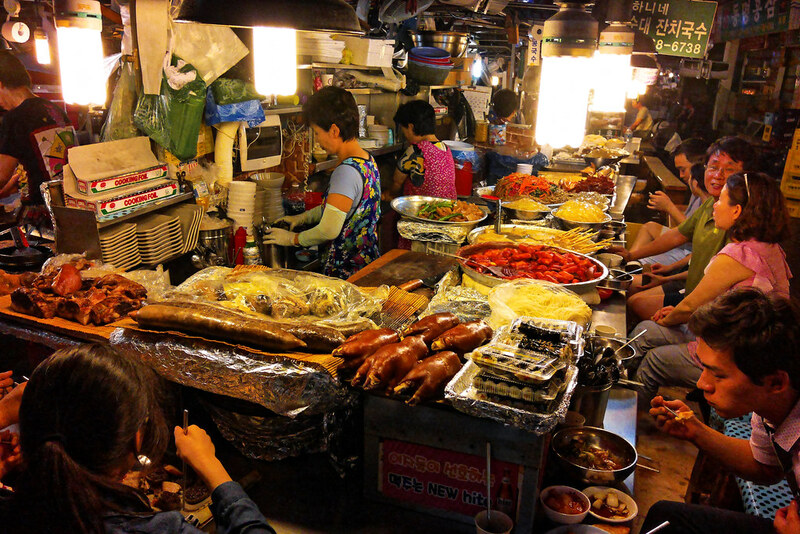 The culinary delights of Gwangjang Market are just 6 minutes away by foot. JW Marriott Dongdaemun Square Seoul: The top luxury hotel in the Dongdaemun area. Rooms are adorned with delightfully contemporary decor and plenty of space. Deluxe suites enchant with their floor-to-ceiling windows that unfold captivating views of Dongdaemun Gate.